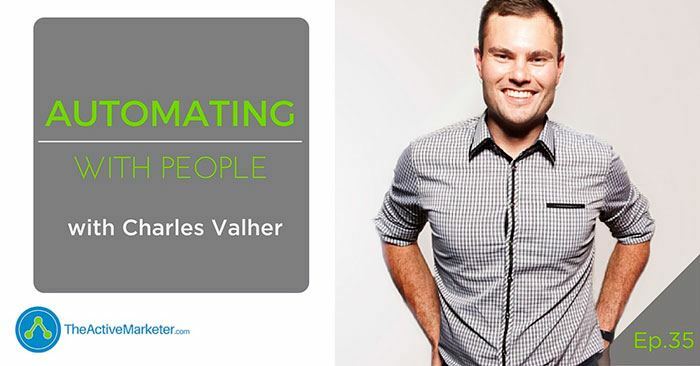 In episode 35, I chat with Charles Valher, Co-founder of Outsourcing Angel a trusted provider of outsourced solutions. Barry: Yeah, it's kind of the same thing I'd say with active campaign rights, a blank canvas you can do anything you want. The problem is it's a blank canvas and you can do anything you want. Announcer: Welcome to the Active Marketer podcast where we talk about how to design, automate, and scale your business to the next level using sales and marketing automation. You can find out all the tips, tactics, and the techniques you need to get more customers and sell more stuff over at the activemarketer.com. Now, here's your host, Barry Moore. Barry: Welcome to the Active Marketer podcast where talk about all things sales, funnels and marketing automation. I'm your host, Barry Moore. I'd like to thank you for stopping by and listening today. Today we've got a little bit of a departure. We're normally talking about software tools that can help us automate but one thing you can also do is get people to help you automate as well. So, we're going to talk to Charles Valher from Outsourcing Angel which is a V.A. company that helps you source and locate V.A.s and we're going to talk about the most effective way to work people into your automation so, if you're going to create some SOPs for a particular process that you have in your business and you want to get other people on board, some virtual assistance on board, to help you with that process so you are not doing it all yourself, which you shouldn't as a business owner and entrepreneur. We're going to talk about the best way to work some virtual assistance into your business. So let's get into this week's episode on automating with people. Oh, I'd like to welcome to the podcast, Charles Valher from outsourcingangel.com.iu. Welcome, Charles. Charles: Thanks for having me, Barry. Barry: I wanted to get you on the podcast today to talk about V.A.s. You know, Outsourcing Angel is a managed V.A. company here in Australia and they provide V.A.s to anybody who wants them to work in their business. So, I think it's a great topic to compare and contrast software automation versus people automation and where you can use each to its best effect. But before we get into that, why don't you tell me a little bit about Outsourcing Angel and what is a V.A. for those people who don't know what we're talking about yet? Charles: Yeah, a great place to start. So, I'll start with that. So, a V.A. is essentially a virtual assistant, so it's very similar to how an assistant is perceived by most people but it's just obviously that they live online so they're virtually in an assistant to … As for Outsourcing Angels and what it's all about, there is, effectively, as you mentioned, a hiring company for V.A.s so we take the work out of training the right people and positioning them in your business to do really effective work. Barry: Yeah, okay. I think that's an important point not to overlook. I know, maybe, you and I probably travel in circles where we either have V.A. or we know people who have V.A.s or around entrepreneurs all days that are preaching about getting V.A.s in your business to help you scale. But for someone who has never done it before, it can be a bit of a daunting task because, typically, as V.A.s, not necessarily always, but typically they're overseas somewhere so you're not being able to touch them, feel them, talk to them, put your hands on them and have that face-to-face kind of meeting. So, I think a lot of people can have a lot of trepidation around getting started. So maybe we talk about how we get started. So, obviously here at the Echo market, we talk a lot about software automation using market and automation sales, automation in your business. But you don't want to, even I will tell you, you don't want to be completely software focused, the way that you are going to distinguish yourself from your competition and the rest of the market is by having more human touchpoints in your business than anybody else. So, that personalised service that you can give people is what really makes you stand out from a crowd so let's talk a little bit about software automation versus people automation. There are some tasks, probably in your business that are better suited to having real people do them than to just automated software routine. So, what kind of things are your V.A.s that you place, what kind of tasks are they doing to grade success in other people's business? Charles: Yeah, look, that's a great question, I suppose it's what side are you on, the man or the machines? It's very much that way like as much as so much software is fantastic, I just don't think it does have that personal touch or it's not there yet, as you mentioned. So, some of the best stuff I look at and go, “What can we get off the plate, is something like you're thinking tasks that we consider very very day-to-day.” So, a great example of that might be your help desk. So, if a client or a customer contacts you and they need something solved, one way of solving that might be an automated email that says, “Thank you. Your inquiries are now in the queue.” Which is great, it's a contact point. But then, having a virtual assistant then take that task and make sure it's dealt with and then responding to the customer, letting him know it's dumb is where that human element comes into the arrangement. Barry: Yes, so I think, to a lot of people who might have some misconceptions about V.A.s and what they can do. I've seen people with V.A.s with horror stories about, quote on quote, “They can't do anything. It's always been a giant mess,” and I've seen people whose whole business runs on V.A.s and they hardly ever touch their business themselves at all, so what are some common misconceptions do you see from your clients around starting to get working with V.A.s? So, I think a lot of it is being prepared and having things in place for your V.A. to do well and that comes back to things like having procedures and having tasks planned out. A good buddy of mine actually recommended a piece of software to me, Dave Jennings, called Rescue Time, and he said to me, “Look, instal this on your computer and then see what you actually get up to for a week.” Now, what Rescue Time does this kind of track when you spend your time on the internet?” And I thought, putting it in there, he kind of tell me, “Wow, you're spending way too much time on Facebook.” Which wasn't actually the case. My biggest problem was email. I was putting a lot of time in email and I was like, “Okay, if I'm spending three to four hours a day in email, how is it going to be possible for me to get anything done?” So, straight away, I knew if I could find a V.A. who could help me manage my inbox, that would be a really good task to get off my plate and a really high point of leverage. So that's what we kind of look at, that's the places to start and what other things that you are actually doing that you can have a goal at removing and trialling that out? And that's where a lot of people get their success from. Barry: Yeah, absolutely, so you definitely find those leverage points where the lever can move a big rock and you can be more productive. But what do you think actually is the root cause of that, quote on quote, “V.A. horror story” for most people? Do you think that it comes down to the fact that they don't really know their businesses as well as they think they do or they don't have it as organised as well as they possibly should? Is there some sort of root cause in there, for most of those horror stories? Charles: Yeah, look, it's an accommodation of these three or it can it's like, on number one is it really can be the person, sometimes you can just get a dud, but that could be in any business and we do see that. People love to lie on resumes and interviews and I'm not putting that down to virtual stuff, that's just in general. So if you're hiring process isn't very thorough and you actually do end up with a dud, you are going to have a bad time. The second part of that is if you are expecting a clone, someone who is going to come into your business and be you, then you're doomed, they don't exist. And if they did, they'd probably start a business to compete against you. So, that's the second one. And then the third one is everyone can be really excited in getting a V.A. and things like that but they never account for the time that they need to put into them to develop them to be strong. Yeah, kind of a crust those three is where I see the biggest issues. Barry: Yeah, and some of that certainly rings true when I first started working with my first V.A. I think it was an interesting mental exercise in my own head and I'm sure it's fairly similar for entrepreneurs out there. It really makes you look at the business in a different light. Like, when it's all you and maybe you and a couple of outsources that you outsource pieces of work to, that's really easy to manage but, as soon as you need to start explaining your business to someone else that's working inside of it, it makes you look at it in a different light and you go right, I really don't have these processes in place, everything's in my head. So, I really don't really have a business, that's not even a real business, that's not something that you can sell, that's not something that you can replicate and it's not something that you can scale. So, I think even the process of doing it makes you a bit more honest about what your own business looks like if you're self-reflective at all. Charles: 100 percent. That's one of the reasons that I'm Outsourcing Angel, we do have a thirty minute session with every client before we even give them a V.A. use for that check. We want to spend time with someone, looking at those things and helping them identify it in the beginning because if someone's not ready or they're not haven't had that process yet, well they haven't really had a V.A. and they're ready to introduce someone, there could potentially be some pretty big holes in the business and that's not going to work. Barry: Yeah. For sure, actually, for sure. All right. So, maybe even, let's back up and point out I was going to ask you how you find a good V.A., but let's even back up and point is how do you know you are ready to find a V.A.? How do you know you are ready to hand over work? Charles: Yeah, good great question. I guess step one is going through and making a list of all the tasks you actually think you can get off your plate. Now, if you can't write any tasks down, that's a pretty good red flag. The second point from there is I would look at all the software you are currently using that could be taking up your time. So, if you're someone who sets up a lot of webinars or anything like that and you go, “Wow, really? If someone else did this and used these tools for me, that would save me a lot of time.” And then the third way is, whether I've mentioned Rescue Time via a bit of software, you can actually really isolate where you are spending your time, that can always be a good place to start from what you should be getting rid of. Barry: Okay. And I think, maybe two, one of the misconceptions is that you can find some V.A. that knows your business as well as you can do and just take over without any training and just know what you're thinking, I think I've seen that, not from me but I've seen that happen to a few other people as well. Charles: Aw, I tried that part. That was me. Charles: Yeah, look, I really stand by this and obviously we do find V.A.s and we're always going to say we're the best option and if you're not going to use us and you're going to go into the wilderness, the best way I can say is take your time, interview well, and then always do a paid audition. Make people come into the business and actually pay them for a day to do a trial or even a couple of hours just to see what they've really got because what can be really hard when you haven't got a V.A. is if you're comparing one person and you're trying to see if they're good or not, you've got no comparison. But if you've paid five people the same task, chances are you are going to see a very big difference between the five, and there'll be a stand out and there might be two standouts but at least that's really give you the difference over just straight hiring or, often, interview one on Odesk or Upwork. Barry: So, you find that standout or those standouts and you say, “All right, so this person is the one that we're going to go ahead with.” So, what's the realistic expectation of how much time you're going to spend? They're not going to be effective, probably not going to be effective tomorrow. You probably need to train them, get them familiar with your business and how it works and what you need them to do, so what's a realistic ramp up time for that sort of thing? Charles: Yeah, so my V.A. now, Judy, who was an absolute rock star, we being to get off probably about seven months. I got her a while ago and I had her from day one of working with her in the first months, they were awesome challenges, there's a lot of communication time and just moving those things up. And it's kind of like a snowball accumulating, it gets bigger and moves faster down the hill and then gets quicker and quicker to the point where you know we're six months in now and she knows me very, very well and a lot of the things she can already anticipate for. So, to get someone from day one, if you look at the longterm in six months, things are going to be very, very good. When they start being efficient is probably about that month, too, when you start to get those one or two crucial tasks off your plate and then it's all about one thing at a time, “What's that one task I can introduce, this way, to get some practise in?” So that they can take that task the whole time. Charles: Yeah, great question as well. So, I'm a really great fan about Screenflow, I think that's, hands down, the best way to do training. If you can record yourself doing a task and talking through it, so that's really important, talking through yourself, doing it, and why you're doing it that way. You just created a resource that can be a standard operating procedure, for one, so they can save that and review it whenever they're doing that task. And then, two, it helps them get kind of a view on how you're going about the task so they can copy it. So that's a really important from there, so the next part, if you really want to get great quality work, it's spending time and correcting their work and talking through what they've done and allowing them to improve. So the first time you do anything is effectively going to be the worst. And if you've got the patience to go, “All right, let's do that again, and again, and again,” it'll get to a point where you are getting a really high quality work as you would do it off that video. Barry: Cool, and then, so, what tools are you using are you using post, for one, for communication that communication back and forth, is it something as simple as Skype or either better tools that you can look over their shoulder if you will and how you're organising it, those SOPs, because I can imagine, over time, when you start creating these standard operating procedures that you are accumulating a library of procedures, you've somehow got a track and they got to be able to find the procedure that they need. So what are some tools in there to help with that? Charles: Well, I'll have to laugh because I'm actually the worst at this. I only know this because I've made the mistakes so don't do this and you'll be fine. So, first off, don't use email. Email is terrible. The amount of things I've lost in email over the years is just astounding. So, dropbox we're a really big fan of for, if you are going to use Screenflow to record something, dropbox is where we store it and then we try to give it a label. That's how we started out and that was a really good system. In more recent times, we've actually moved everything into PODIO. So what we do is, and PODIO, just for those of you who don't know, is effectively like a product management tool much like TRALO or ASON or things like that. But, effectively, we started, every time we make a procedure, we store that in PODIO so it's really easy to find. And if we do have to train a new staff member, then, effectively, they've got a library already sitting there of how to do things. The tools itself I've mentioned is Screenflow, really good one from there. PODIO actually has a free version so if you want to start with that as well, it's also available. As for day-to-day communications, I'm still a really big fan of Skype, I think it's really great for quick communications. I know if you guys are using SLACK but I guess there's a little hidden gem here as well as, I actually use Facebook chat with my V.A. for the simple reason it has voice recordings. So I found it to be really effective to leave a voice message for my V.A., also. Barry: SLACK, I'm a big fan of SLACK but there has been a bit of a learning curve there, it's not quite as easy as just popping up the Skype and having a chat with somebody, that's for sure. But if you invest a little time and it's pretty cool and, obviously, you put me on the PODIO a while back and I'm becoming a big fan because it's so, basically, customizable that I think the problem, the problem I've had with a lot of project management tools in the past is you buy the tool and you have to do the workflow their way, whatever work flows inside the tool whereas PODIO you can customise that workflow to an almost annoyingly infinite degree if you want to. Charles: You're [joging 00:18:09] my language barrier like I'm probably one of the biggest fans of PODIO out there and could do a whole ‘nother episode just on PODIO, if you want to. But I agree with you, it's fantastic from that customizable point of view. The challenge is when you've got freedom to build anything, it can become quite overwhelming so a lot of people got to get stuck on that point but if you can stick it out and work on your system, I think PODIO is the ultimate. Barry: Yeah, it's the same thing, I'd say, with active campaign rights, a blank canvas you can do anything you want. The problem is it's a blank canvas and you can do anything you want. Barry: So, PODIO is kind of the same way. And tell us a bit about, speaking of PODIO, so I think PODIO is a good tool, one for managing any process in your business, whatever that process is because you can mirror what you're doing now and put it into the tool which may or not may not be a good idea. At least, you've got it documented and the process is now in a tool that you can outsource elements of that process or certain tasks associated with that process to different V.A.s and different people. But I know you've taken PODIO to a next level so let's talk a bit about PODIO so they can walk away with an automation tool and they can walk away with a people automation plan as well. Charles: Well, the secret is you get a V.A. and PODIO. The V.A. manages PODIO. Barry: There you go. Excellent, fantastic. So, what are the kind of power features or hidden gems in PODIO that you've found? Charles: Yeah, look, the hidden gems in PODIO, there's a tonne of good options in the market like a lot of people love ASONAR and that, which I'm not against but where PODIO comes into its own element is the fact that you can design your own [flugs 00:19:55]. And what I mean by that is in our business day to day, we might have new leads, an onboarding system, and then a client system. But it's a very custom to wage business so what I need for onboarding may be very different to another business. And that's why I set templates so flows don't really work. The power features with PODIO is that you can pretty much flow out your own business and run PODIO like a system. So, over other things like TRALO where it could be a mess, this is where it becomes very, very organised. I suppose another really good power feature is just the connectivity to other things. So, we're looking at the API integrations into something like zero is, which is an accounting software, meaning that the options are there in which you can fly far and alert in PODIO if someone hasn't paid their invoice. Well, that you need to send another invoice. Barry: Yeah, very cool. And you've been playing around with Glow Be Flow lately, is that right? Charles: Yeah. Glow Be Flow is like a, we say it's like the steroids for PODIO, in all honesty. Very very lucky, a friend got me on twitter a while back and this is … I guess the best way to describe Glow Be Flow is that you can set off flows. So this is something I know you are a big fan of, Barry, but if you got a type of project for you, do it every time. So this might be, you got 20 tasks that happen every time you get a new client, to have that automatically created every time you create a new client in PODIO is going to save you about 20 minutes in set up, which I just think is a great great feature. And then the other side of things, when you look at that as well, is you can have tasks fire off the completion of other tasks. So, if you're in a business where you require three or four people touching thing and the last person needs to finish up before the next person can start, the idea of one team member ticking off, “I'm done,” and then a task is created for another team member was very very crucial to us. Barry: Yeah, it's very cool. It's well worth a look. As Charles was saying that if you have some sort of projects, so in PODIO you have workspaces and you might have a project workspace where you are managing multiple projects but maybe have four or five certain types of projects and say, a migration project has these 15 task, so if you say “create a new project,” what kind of project is it, oh it's a migration project, click, save, there's your 20 task, there's your fifteen tasks already built up, already assigned to whoever they need to be assigned to in two seconds, it's great. I think the cool bit about, as you say, going hand in hand in working with a V.A. is, while you're designing those processes in PODIO, you're going right. Okay, I do this bit, they do that bit, I do this bit, they do that bit. And as you're building the process out, you're also thinking about who does a Wikipedia of that process as well, which is pretty cool. Charles: That's, I suppose you were going to mention this earlier as well, it's like it forces you to ask yourself the right questions and then work out how you can systemize things. And that's what I truly love about it is, when you can work out your flow and how you're actually working on designing your system, effectively you're then making it replaceable, meaning someone else could do it, not you, because you've got something that can be followed and I think that's incredibly valuable to all businesses. Barry: Yeah, and back to the three pillars from the act of marketer design, automated scales, so if you're designing that process flow in PODIO or whatever happens to be the tool of your choices and you figure out how you're going to automate this process going forward and then the scale bit can either be even more software or it can be more V.A.s, one V.A., two V.A., 10 V.A.s, well however many you need in order to scale that process to however big you wanted to go. Just pretty cool. Barry: All right, so, just going back to getting some V.A.s on board to help you out and pick up those parts of the process that you are going to need to scale with people versus software. What are some of the common mistakes of when people first get a V.A. on board? Charles: I guess the most common mistake we see with, across the board, so this is number one, so I use the medical analogy here where you have a cold, it's perfectly fine to go and see a G.P., a general practitioner, they can solve a pretty general, problem know we're sure at all. And they can even refer to a specialist but if you have a very unique heart condition, then a G.P. is not the person you want to see. You want to see a heart specialist. So, I guess in the online world, I know these can be a little bit confusing but, sometimes, people have got a task that is a very general task, which is great and that's perfec … And then, at other times, they really need like a developer or someone who can write code for a very specialist task. So, one of the most common mistakes is expectations that a V.A. can do really really defined work that eases specialists work and someone you should get, someone who has all day long to do and you'll get a really better result. So this comes back to the start up, what are the tasks that I actually want to give a V.A. and have it do all or do I want to invest in my V.A. to learn that type of skill. Barry: Yeah, I was too into managing teams since I've left university in one form or another and I always find, people are always going to do best on the stuff they're interested in. So if you find out what their motivation is and what they really love to do, obviously they'll do that job much much better than some other job that you give them so you play to people strengths as well ask them what they want to do, ask them what they're excited about and they'll far and away exceed your expectations or just farming off general work to them, if you know what I mean? Charles: Ah, absolutely. And the key example would be copywriting, in my opinion. I wouldn't hire a virtual assistant and then expect them to be able to overwrite sound's copy. I think that's a very specialist skill. Go hire a copywriter. Barry: Yeah, I can't do it. Well, I may be able to do it right, so. Charles: Well, you may be surprised. So, that's one of them and then the other one, one of the common ones, is web development. The sum basic tasks of V.A. can be trained for but if you are expecting sites to be built or membership sites, definitely use a specialist, you're going to get a much better return. Barry: Yeah, for sure. And, I guess, too, it comes down to is it a task that I'm going to do over and over again or is it, if you're talking about a membership sites, that sort of thing, that's something you're going to have to do once and then it's done and then you're not going to really need that skill set anymore so maybe you're better off getting a contractor on board whose whole job or whole profession it is doing that one thing. Barry: Yeah, good point. All right. So, we've decided we want a V.A., we won't put one on tomorrow, what's the first steps. Charles: So the first steps, or if you would like to come in and get a V.A. with Outsourcing Angel, the first step is to go to outsourcingangels.com.iu and fill out a inquiry form. But in all honesty, going through that process of self evaluation, have you got the stuff there to make this all work? And then be willing to trial different people or different V.A.s or do those interviews and just taking it one bite at a time. Start with the key task you can get off their plate, do it really really well, and then take it small things at a time. Barry: And do you suggest someone go for a thirty hour week person or part-time or does it really just depend on what the requirements are? Charles: Yeah, great question. So, a lot of people start with a part-time V.A., obviously for the economics. It's cheaper to start with a part-time V.A. But we're all kind of go with that one, he's like, “I will wind strike to a full time V.A. before I have enough work for them.” And I made the decision that, in the down time or when I didn't have work for them, I was going get them to train. So I said, “Whenever I don't have work for you, this is what I want you to be doing,” and we started with things like photoshop. So, for the first month, my V.A. was practising her photoshop for one or two hours extra a week, and she really developed that skill quite quickly so I actually quite was able to add a really valuable skill to my business in the down time. And then, the second thing we went with was PODIOs and my V.A. was watching hours and hours of PODIO training which is actually one of the best things we ever did because she actually runs the PODIO for the business now and she comes up with all kinds of great ideas and is getting proactive with it, which has been great. But that never would have happened unless I gave her that opportunity. So, sometimes, we're giving people a little bit more time and investing in the training can be really really valuable. Barry: Yeah. Good idea, good idea. I didn't think of that. I'll have to do that now. All right, Charles, well thank you very much. Thanks for coming on and sharing your insight with us about how to hire and manage V.A.s and automate your business with the people as well as software. Outsourcingangel.com.iu, the best place for people to get in touch with you? Barry: Okay, cool. Well, thanks for that and we'll look forward to seeing you online. Charles: Thanks for seeing me, Barry. Barry: Thanks, Charles. Well, thanks very much to Charles and sharing his expertise on sourcing V.A.s. And if you want to head over to the show notes over in theactivemarketer.com\VA, you'll find all the show notes and all the links we've mentioned in the show so you can get further information on how you can start putting V.A.s to work in your business which I highly recommend. And, if you can do us a favour and head over to itunes and leave us a review on itunes, that's how they rank you, that's how it drives your podcast up near the top and helps other people find this information. So if you found this episode useful, please go over to itunes and give us a rating and review and share it with somebody who also might find it useful. So, look forward to seeing you next week on the Active Marketer podcast. In the meantime, get out there and design, automate, and scale your business to the next level with sales and marketing automation. Thanks, everyone. Announcer: Thanks for listening to the Active Marketer podcast. You can find the show notes and all the latest automation news over at theactivemarker.com.